Andrea Grisdale is living life as if she were in a bestselling novel. Similar to the subject of the book-turned-movie “Under the Tuscan Sun,” Grisdale, an English expatriate who took a vacation in Italy and never went back to Britain, bought, restored and renovated a historical palazzo with the help of local artisans and the use of Italian textiles, upholstery and artwork. For the past few years she has operated “Palazzo del Vice Re” as an old-world, luxury boutique hotel “under the Lake Como sun.” It’s hidden just behind the leafy corner of a colorful piazza at the harbor in the picturesque fishing village of Lezzeno, only a few miles from Bellagio, which guests can visit via water taxi or car. The Lake Como region is 90-minutes from Milan-Malpensa airport. What is it about Italy in general that attracts and satisfies so many vacationers, including Grisdale, who decided to plant new roots there? “Italy has everything. Food, wine, nature, history, culture, fashion, the climate, you name it,” she said. Palazzo del Vice Re, open seasonally as a lakeside retreat provides opportunities for hikes, boat rides, kayaking, splashing around in a large hot tub, swimming in the lake, family meals, pizza making, and shopping – an outlet mall just over the Swiss border sells the sought-after Italian-label fashions at equally desirable prices. Maybe the best endeavor, though, is to relax at the palace and engage in the sweet idleness Italians call “dolce far’ niente.” Sublime moments such as these might seem the unattainable stuff of literature or paintings, but they are livable. Lingering over a latte under 400 year-old ceiling frescos or sipping a local vintage from Valtellina beneath a stone-clad, vaulted ceiling in Bar Barbarossa seem like a dream come true, especially for guests who’ve just tossed a coin into the palazzo’s antique wishing well. Cured meats, olives, cheeses and Italian cuisine consumed in a candlelit cantina are a daily part of life in the palazzo. American Express Travel recently named Palazzo del Vicere to its prized “Hotel Collection” recommended list. The rate for a stylish single room is $343; while families or small groups can reside in tony two and three-bedroom apartments with views for only $680 per-night. 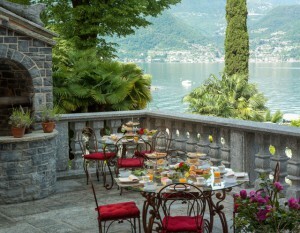 Learn more and reserve a dream directly with Grisdale at PalazzoDelVicere.com.